4.5" wide, 14" long and 2.5" thick overall. Sold in packs of 4. 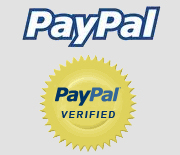 In sloped or flat design. Made from flame retardant foam. 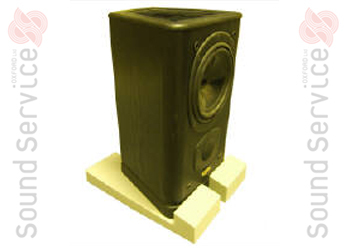 These anti-vibration pads when used to isolate speakers will reduce vibration and increase the tone and quality of music and final mix. When you are recording or mixing your music you need the room and the equipment in that room to be totally isolated from the room and also the area where it is mounted. These Speaker Isolators help you to do that. 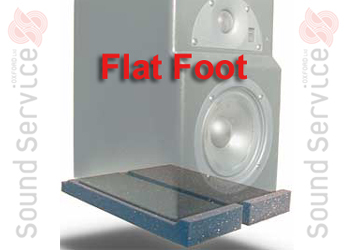 They are made of high density flexible foam capable of withstanding heavy loads yet maintain stability. By decoupling your speakers the quality of the music will be enhanced due to the reduction of vibration from the speakers and any furniture they may be mounted on. This effectively stops the furniture around the speakers from clouding the mix and also helps reduce reverberation that comes from nearby furniture. There are 4 pads per pack and are available in light grey only. 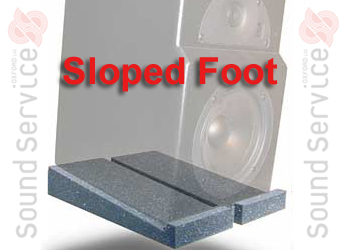 They can be sloped or flat. Please specify which set you would like when ordering. Yes. It meets the requirements of schedule 1, part 1 the Furniture and Furnishings (fire) (safety) Regulations 1988 (amended 1989). Also no CFC's of HCFC's are used as alternative blowing agents in the manufacture of these foam grades, all water blown technology is used. No brominated compounds are used in the manufacture of these foam grades.